Adoption of appropriate legislations in response to the development thrusts of the Province. Certification of Bohol Provincial LGU as an ISO 14001(for Environmental Management System), the first provincial LGU to earn that distinction in the Philippines and in Southeast Asia. 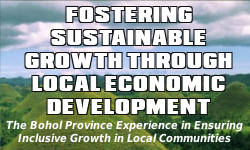 Formulation of the Bohol Poverty Reduction Program Framework Plan: 2002-2012 to ensure a cohesive response to the poverty situation in the province. The implementation of the 260.70 kilometer Bohol Circumferential Road is very important for the provincial economy, cutting travel time by more than 50 percent. Started on the second quarter of 1997, Phase I was completed sometime in 2001 with the Phase II of the Project programmed to be completed in two to three year’s in time. A project costing over U$$15.0 million by the Japanese Government through JBIC , the project provides geothermal power from Leyte Province to Bohol, which presently is providing 18 megawatts of electricity to the province. Phase II of the project is currently being implemented. Also funded by the Japanese Government, the BIP is the irrigation component of the BIAD Project irrigating a total of 10,260 hectares of rice lands in the northeastern part of the province. Phase I was completed in 1997 while Phase II is on-going. PITE Project is one of the pilot tourism to be established in the Philippines as embodied in the Philippine Tourism Master Plan. It is one of the major projects pursued by the Provincial Government of Bohol. The Projects covers a total area of 2,000 hectares that includes the construction of resort hotels and cluster-type residential villas, and a retirement village, among others in Panglao Island. Also a component of the project is the construction of an airport of international standards.